California homes are usually storage challenged. Basements generally don’t exist here, and attics are typically useless. Garages are most often outfitted as man-caves or warehouses. But I’ve noticed that my garage is actually attached to the driveway, and is a convenient place to store our cars when they are not being driven around. So for as long as I’ve lived in this house, the lawnmower, edger, rakes, shovels, and their kin have been trashily resting in a heap on the side of the house. This year, I finally broke down, and decided to buy a shed. I found that there are three types of sheds in the universe: Expensive, Cheap, and Very Cheap. It should be noted that all three of these are actually expensive, just to varying degrees. In my case, I was in the market for something about 8 feet by 8 feet in size. So to elaborate… Expensive style sheds are fabricated from actual wood, and assembled like actual buildings, but smaller. Cheap Sheds are, as best as I can tell, pre-fabricated from high-fructose wood-flavored particle fibers, packaged into transportable bundles, and then assembled on site. Very Cheap sheds are fabricated from simulated plastic, and assembled like simulated garbage cans, but larger and more rectangular. So, considering my personal circumstances, I quickly decided that I was in the market for a Cheap shed. Naturally, I then visited both purveyors of such outdoor storage solutions: orange and blue. Home Depot has aligned itself with an outfit called Tuff Shed. 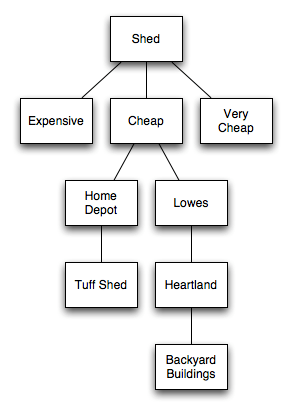 You can specify and buy your Cheap Shed from Home Depot or from Tuff Shed directly. The results are exactly the same in either case. Expensive. The “Garden Ranch” 8×8 shed with shingles and some shelves quoted out at $1,600, delivered and assembled. Seems steep. Over at Lowes, you can buy a Heartland Liberty 8×8 shed for $749 plus shipping, unassembled. Sounds better, but what about my shelves? And assembly? And what if I want a window and weather vane on top? Their website was much less versatile than the Home Depot / Tuff Shed site, so I decided to go to the source. But it didn’t exist. “Heartland”, it seems, is just a thinly disguised rebranding of the pre-fab sheds sold by “Backyard Buildings & More” aka Backyard Products LLC, which seems to be located somewhere in Michigan. Or, more conveniently, on the interweb at http://backyardbuildings.com. So I dialed them up, found that the Lowes “Heartland Liberty” is suspiciously identical to their “Value Line Seneca” shed, and it can be customized as desired (just the shelves in my case), equipped with shingles, shipped, and assembled for about $1,000. Now that’s the Cheap Shed I was looking for. I placed the order online, and forgot about it for a week. When I noticed that a shed failed to materialized anywhere in the vicinity of my home or back yard, I became a bit concerned. Checking the email confirmation, they should have called me to schedule delivery within 48 hours. Uh oh. So I called the distributor at the number listed on the invoice, and talked with someone who seemed a bit confused. Eventually, he admitted to finding my order, and asked when I wanted it. Well, how about Monday? No problem. They’ll call in the morning. On Monday, I got a call from the driver, who wanted to confirm my street address, which he correctly identified. Except he thought it was in Sacramento. Which is about an hour and a half away. Remarkably, though, he and his able assistant actually arrived at the correct location eventually, sporting their “Lowes” shirts. While they seemed a bit put off about having to drive to Pleasanton, they did successfully assemble the thing in about four hours. Backyard Buildings seemed a bit shady to me when I was considering what to buy, but all and all, everything worked out OK. I would say that the Tuff Shed model that I checked out at the Orange store seemed to have a bit high build quality, but I think that can be attributed almost entirely to the door latch / handle which was much more substantial on the Tuff Shed. Otherwise, they seems to be built from the same particle fiberboard stuff, and both have that weird smell inside. Backyard Buildings doesn’t offer an option for painting, which was available for $131 from Tuff Shed. But I bought some paint for about $30 and did it myself in a couple of hours. In my research, I found The Internets seemed to be sadly lacking in rambling essays on applied shed research and procurement practices. This unfortunate void has now been filled, as has my freshly painted and still weirdly smelling shed. An unsuccessful attempt to open the filter. In my town, we receive a months supply of free minerals every day, delivered conveniently through the city water supply. This is a wonderful benefit for everyone, especially sinks, faucets, shower doors, spigots, hot water heaters, and all sorts of other plumbing fixtures that automatically accumulate valuable white crystals during their normal use. So rich are these mineral deposits, in fact, that many such fixtures are afforded the opportunity to retire early. Many have. A few years ago, I decided that we had accumulated more than our fair share of minerals. We installed a water softener, thus magically exchanging our minerals for IONS. Specifically, sodium ions, in fact. And while the toilet, shower, and washing machine are delighted to consume these ions, we didn’t really want to drink them, or cook our spaghetti in them either. So we did some homework, contemplated the options, talked with a plumber. He recommended a Watts Premier WP-5 One Piece Manifold Reverse Osmosis System, conveniently available for delivery from CostCow.com for the low low price of $160. Installed under the sink, it quietly provides us with an infinite supply of drinking water, certified to be free from arsenic, cysts (cryptosporidium, giardia, entamoeba and/or toxoplasm), barium, hexavalent chromium, trivalent chromium, copper, lead, fluoride, cadmium, radium 226/228, selenium, TDS and turbidity. And, of course, sodium ions. Turn off the incoming water, and drained the pressure from the system, per protocol. Use genuine plastic toy wrench to unscrew filter bowls. Fail. Become frustrated, and generously use colorful language. Consult Watts Premier Troubleshooting page. Fail. Consult Internets. On the Costco review page, WindWalker from New Jersey suggests “The trick is to unscrew and release some of the tubes first. What happened was that the air pressure pushes against the filter caps tight and makes it hard to budge. But if you loosen us a few tubes (closer to the filter caps), it will release the pressure, and make it much easier to unscrew the filter caps.” Thank you Internets, this is why you were invented! Remove the tubes and wait a little while, then try again. FAIL. Oh, noes! The Internets have mislead me. Try harder, adding a pry bar to the genuine plastic toy wrench to get more leverage. Stand on manifold to stabilize filter body, and express increasing rage. FAIL. Stop for a moment and think about which way loosens the thing, and which way tightens it. Yep, that’s the right way. Enjoy another moment of rage. Consult the Home Despot. Purchase an $8 Husky Strap Wrench, which looks like just the thing to solve this problem. Remove from packaging. It smells bad. 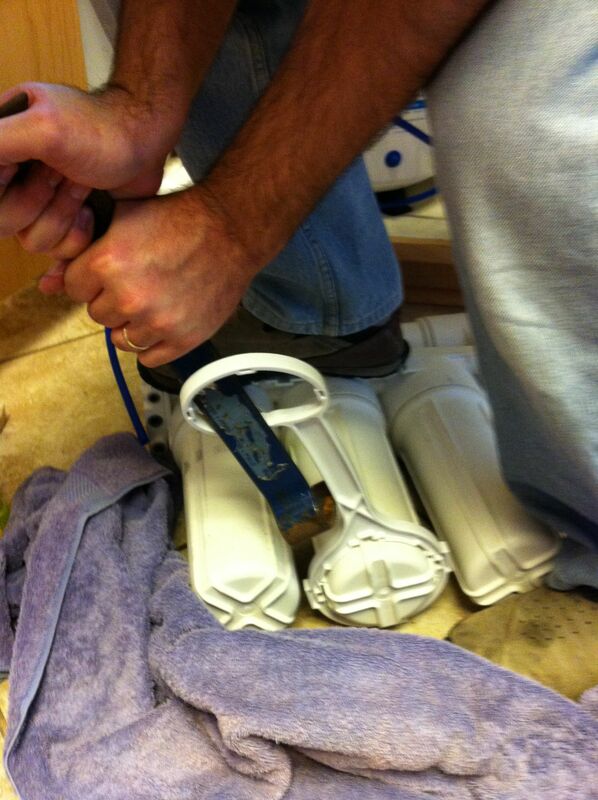 Now repeat with second bowl, apply force, and break new strap wrench in two places. FAIL. Move the leaky and partially dismembered filter to the garage for a week so it can think about what it has done. Write to Watts Premier customer service and ask them for advice. Wait a week, then call them to ask why they haven’t responded. They haven’t responded because they don’t know what to do either. Remove the entire filter assembly. Place the whole thing in a tub of hot water. This, people of the Internet, it is secret you came to this page to find. Drive to the Home Despot and exchange and/or buy an $8 Husky Strap Wrench. Open package. It smells bad. Remove the filter from the now somewhat less hot water. Use strap to unscrew the filter bowls. I was able to contact an actual human at Watts Premier when I called them. Let’s call her Ginger, which I think is her telephone name. She was very apologetic, and very nice, but had no useful advice whatsoever. She did suggest, though, that if I was able get the thing open, I could remove the lower O-ring when replacing the filter bowl, because they’ve found that it can make the seal too tight. O RLY? Well, that’s good to know. Since my hot water + strap wrench trick seems to work OK, I left the second O-rings in there. Wouldn’t want it to be too easy next time! Every fall for the past dozen years, Washington DC has hosted the annual celebration of cardiovascular medical device innovation, inspiration, teaching, marketing, controversy, and edutainment known as TCT. During this week, leading physicians, industry brass, deal makers, and investors mix at scientific sessions, banquet rooms, expo halls, bars, and restaurants at the heart of the heart business. Every year, it seems, has at least a few memorably controversial moments. My first TCT was not in Washington, but in Milano, Italia. The year was 1997, and I was at the cath lab of legendary innovator Antonio Colombo, along with a host of other industry folks, all hoping that this diminutive giant of interventionl cardiology would honor us by using our particular widget during a live case transmission. Alas, the unremarkable Mini Crown stent that I brought never did make it to prime time. He did, however, open the first live transmission of the conference by performing balloon angioplasty and stenting on a opera singer — while the patient belted out ‘O Sole Mio on the table(!). This was my introduction to the Theater of TCT. Some years later, Colombo opened the conference by implanting perhaps a dozen drug eluting stents in one patient’s coronary arteries. In the opening live case of 2004, a percutaneous aortic valve procedure tragically devolved into urgent practice of CPR and defibrillator techniques. 2001 was one of the few years that I missed TCT; the conference was cut short on its second day by the events of September 11th. This year, for the first time ever, TCT left its home in DC, and came to my own back yard: The Moscone Center in San Francisco. In recent years, the opening cases have been less flamboyantly Italian, and more conservatively Dutch or German. 2009 was no exception, but it was a highlight none the less. In the opening case from Seiburg, Germany, a CoreValve was successfully placed in a 92 year old patient with aortic stenosis. Recently purchased by Medtronic, the CoreValve device prominently features a Nitinol frame — marking the first of many moments where Nitinol took center stage in Cardiology at TCT 2009. While Nitinol has been a headliner in peripheral vascular stenting, carotid stenting, vena cava filters, and guidewires for many years, this marked the first year where this unique material took center stage in matters of the heart. 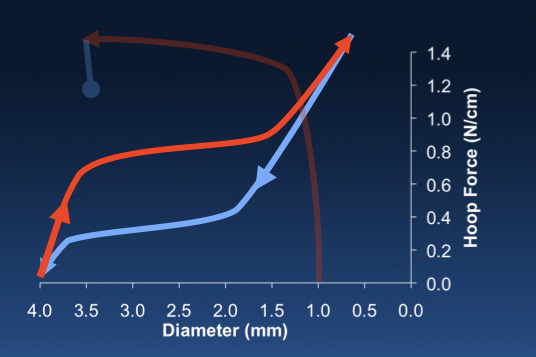 Nitinol featured prominently in Wednesday’s Coronary Stent Design and Device Development session, which was so interesting that it prompted evacuation of the Moscone Center for an hour. Noted author Tom Duerig highlighted the unique properties of Nitinol in his Metals as Implantable Materials talk, followed by some spectacular data presented by Juan Granada demonstrating the performance of Prescient Medical‘s vProtect Luminal Shield, a Nitinol stent designed to stabilize vulnerable coronary lesions. The hits kept coming on Thursday, with over three hours dedicated to The Re-Emergence of Self-Expanding Coronary Stents, which included my contribution (on behalf of “Real Metallurgist” Alan Pelton), Important Stent Design and Delivery System Issues Make All the Difference for Coronary Stents. I joined an all-star cast including Renu Virmani, Barry Katzen, Rob Schwartz, and Stefan Verheye along with friends and fellow JJIS alumni Bob Burgermeister and Hikmat Hojeibane, all singing the praises of Nitinol as a solution for persistent challenges in coronary arterial disease. On this year that the center of the cardiovascular universe came to my home turf, Nitinol and NDC were stars at the heart of TCT Theater. Thank you for your inquiry. Unfortunately, it is not possible today in a tour with receives. Huh? Well, since I received this reply while on the train to Freising, I wasn’t going to give up hope, and if nothing else, I would at least go see what the place looked like. Getting to Freising: This little town is conveniently located at the end of an S-Bahn line, the S1 to be exact, which terminates at the Flughafen or Freising on its northern end. It also happens to be a stop on the main rail line heading from Munich to Prague, so I was able to grab Czech bound train on my way there, and Freising was the first stop. This cut the 45 minute S-Bahn trip down to about 25 minutes. Getting to Weihenstephan: I arrived at about 9:15 am, and headed out of the station attempting to follow my Google Maps walking directions. Of course, I was immediately disoriented, but fortunately found that there were signs pointing to Weihenstephan, and just followed those: straight out the front door, left on a foot path along a canal, past a waterfall, right on another road, over a bridge, and then onto a steep foot path that climbs up the hill leading to the campus above. At the top of the hill, the path ends among some picturesque gardens that are part of the Technical University of Munich at Weihenstephan. The walk took about 20 or 25 minutes, so I was early for the 10am tour. Which was good, because it was completely unclear where the tour started, or if there was even a tour at all. I had to wander around quite a bit before finding the gift shop downhill on the other side of the campus. Here, I used hand gestures and semaphore flags to convey to the shopkeeper my confusion about the tour. She was able to call the office, confirm that there was a tour about to start, and sent me up the hill to meet the guide. Success! The Tour: My group included an Italian family, two other guys, and me. I was the only one that didn’t understand German, but our guide was kind enough to translate the essential bits for me. I taught him that the English word for Gewürznelke is “Clove”, but I don’t think he believed me. He referred to carbon dioxide as CO-W, which I found too amusing to correct. He gave a great tour, even if I couldn’t understand 95% of it. The advertised 60-70 minute duration was actually closer to 3 hours, but regrettably didn’t include tastings (the only part I would have been able to completely understand). There is a restaurant on site, with an outdoor order-at-the-counter style Biergarten option, as well sit-down table service. I opted for the later, and had the ominous sounding but tasty “Pork Knuckle”, bretzels, potato dumpling, and kraut salat accompanied by the unfiltered Pils that’s only available on site, and the renowned Hefe Weiβeier before throwing in the towel. Despite reports to the contrary, they do offer 0.3L servings of some of the beers, but I opted for the 0.5L of each… And bought an assortment of six bottles to carry back downhill. Five of them were wrapped in diapers, packed in the luggage, and are now resting comfortably in my fridge, half a world from their origin, awaiting my liquid revisit of the adventure in the next few days. Since sometime around 20 months, Evan has been obsessed with T-Ball. His first set consisted of a foam bat (good), foam ball (check), and a completely useless T-Ball stand. The top of the thing was busted into pieces within a few days. And the base tipped over constantly, requiring Daddy intervention with each toppling. This “Franklin Sports MLB Foam Teeball Set” represents a tragic lowpoint in teeball technology. If our National Passtime is going to be passed along to a new generation, we’re going to need some Innovation, and not the kind that comes across the Pacific on a container ship. T-Ball 2.0 was born of the Innovation that can only be found on a Saturday moring at Home Depot. This remarkable advance in toddler ball-on-a-stick technology provides a tee formed from PVC pipe attached to a spring that fits neatly into larger PVC pipe fixed in the ground. The benefits of this are many. Two to be exact. 1) It rights itself when stuck with a bat, and 2) It can be removed and replaced easily when mowing the lawn. And also, it seems to be quite durable, as Evan has been beating on it for about a year now, and its still as good as new. So now, on the ocassion of my nephew’s third birthday, I have upgraded the design. Some say I should patent it, but I disagree. This it too important to patent. This innovation must be shared freely, and spread across back yards across the land. 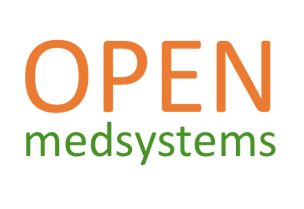 So today, I hereby publish the formerly proprietary design specifications. Internets, I give you Open Source T-Ball v3.0. Materials: 1 Spring (1″ x 12″ x .105″), 1″ Schedule 40 PVC pipe, 3/4″ CPVC pipe, 1/2″ CPVC pipe, 2 Reducing Couplings (3/4″x1/2″), 2 O-rings (7/16″ ID x 1/16″ Wall, Brasscraft part 0576), 1 Bolt. Instructions: See photoset on Flickr for details. The spring that I found had loops at both ends. They have to go. A Dremel cutoff wheel is just the ticket for this job. The resulting shower of sparks is quite satisfying, and makes this project seem like it might be happening on television. Using a Sawsall or other suitably overpowered tool, cut the pipes to length as shown in the photos. Cut the large pipe at an angle to make it easier to pound into the ground later. If you are outside the United States, please note that the dimensions should first be converted from inches to cubits or furlongs according to local custom. This would be a good time to check that you bought the right materials. The spring should fit snuggly inside the 1″ pipe, the small end of the coupler should fit inside the spring, the 3/4″ pipe should fit in the coupler, the 1/2″ pipe should fit inside the 3/4″ pipe with some clearance, and the 1/2″ pipe should fit inside the small end of the other coupler. Actually, a better time to check this would have been before you bought everything then cut it into pieces. The bolt should be long enough to fit across the 1″ pipe. When the spring is inserted into the 1″ pipe, the bottom of the spring will rest on this bolt. The bolt should be positioned so 2-3 inches of spring will protrude from the top of the pipe. Drill pilot holes first. The final drill bit should be sized to match the bolt as closely as possible. The bolt should self-tap its way through the holes if you get it right. Use the Dremel to cut off the extra length of bolt. This provides another opportunity to spray glowing chards of metal into your eyes, or those of innocent onlookers. Now roll the two O-Rings over the 1/2″ pipe, and position them at about 1/3 and 2/3 along the length. Shove the smaller pipe with O-rings into the larger pipe. These two pipes should now fit snugly. This TELESCOPING-HEIGHT ™ innovation is unique to v3.0. I had originally planned to use a series of holes and pins to set the height, but this works much better. Find a suitable location in your own backyard Field of Dreams, and beat the 1″ pipe into the ground with a rubber mallet, piece of lumber, or old shoe. The top of the pipe should be about at ground level, and well below the blades of your lawnmower. Go forth, citizens of the Interweb, and Play T-Ball! Instructions: Drive about 15 minutes from the Pleasanton Home Base, down Calavaras Road to Geary, and into the Sunol Regional Wilderness. Pay $5 if somebody happens to be collecting money. Park at the Green Barn. Drink the first of three bottles of water. Put the second in your back pocket. Walk down the path, cross the foot bridge over Alameda Creek, and follow the signs for Canyon View Trail. 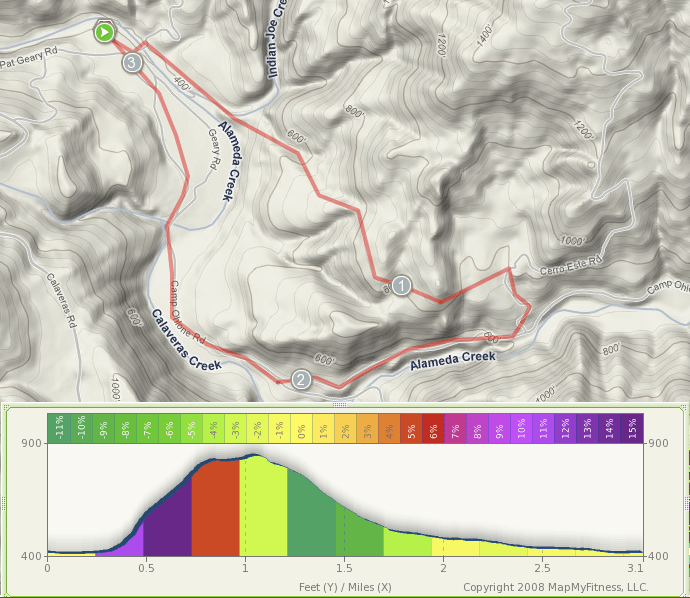 The first mile has some steep uphill climbs; it isn’t too bad once you’re past the squeaky cattle gate. A cool spring day is the bast time for this gig: the hills are green, and carpeted with yellow, orange, and purple wildflowers. At some point, you may need to take a detour around some cattle. Within 45 minutes or so, you’ll hear the rushing waters of “Little Yosemite” below. The clear waters of Calaveras Creek run through a series of waterfalls, between rocks, and around swimming dogs. Sit on a rock, and drink the bottle of water in your back pocket. From here, its a level walk of about 30-45 minutes down Camp Ohlone Road back to the valley floor, the Green Barn, and that last bottle of water. A two hour, three mile hike, 2.5 hours door to door, and back to the Home Base in time for Evan to wake up from his nap. More photos on Flickr. In December, I began work on an epic project. Seeking to recreate one of the greatest accomplishments of my life, and share the experience with my young son, I began inserting cloves into an otherwise perfectly serviceable orange. I had completed one such clove orange in my youth, and for many years, this strange smelling object hung in a closet by a twisted strand of wire. Now, I would recreate the grandeur of this most monumental accomplishment, one small, sharp, aromatic, dried flower bud at a time. Evan found this interesting for approximately four seconds. Undeterred, in the course of several days, with the help of an unlatched safety pin, and the support and/or ambivalence of my family, Phase I of The Clove Orange Project was complete. While the Insertion phase was rewarding on its own accord, the acute result was somewhat unsatisfying relative to my youthful remembrances. I recalled my childhood cloven orange to be rather more dense than this specimen, and was left to wonder if modern cloves had somehow evolved stronger repulsive forces, or if I had gotten somewhat lazier or less diligent about packing density in the years that have passed. Then I recalled the Shriveling Effect. Over time, the perforated orange would shed its Precious Bodily Fluids, concentrating its cloven-citrus essence as its diameter and density shrinks. This motivated somewhat obsessive compulsive data collection, measuring the mass of this curious Object at regular intervals for three months. Again, this activity would not have been possible without the support and/or ambivalence of my lovely wife and son. I am now proud to present, for the first time ever on the Internets, definitive data on the mass of a clove orange as a function of time, while sitting in on a countertop in a suburan residential kitchen in Northern California. 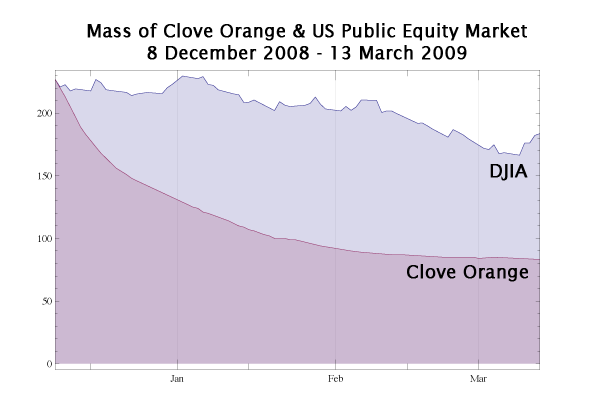 To help put this important dataset in perspective, I have helpfully prepared a chart comparing Clove Orange Mass with the value of the Dow Jones Industrial Average, normalized to be equal to the 227 gram mass of the Clove Orange on December 8th, 2009. The accompanying chart bears a hopeful and optimistic message: While the world economy and US equity markets seem to have been deteriorating at an exponential rate in the past three months, an investment in the Dow 30 would have performed significantly better than an investment in the water molecules contained within this particular cloven orange during the same period. So things really aren’t that bad, even if they do smell a bit strange. Hi, it’s Vince with ShamWow! You’re gonna be slappin’ your troubles away with Slap Chop! Stop having a boring tuna, stop having a boring life: You’re gonna have an exciting life now! You’re gonna love my nuts, watch this… Stop throwing your money away! You’re gonna slap away every day! We’re gonna make America skinny again, One Slap at a Time. Call in the next 20 minutes (“because we can’t do this all day”) and you’ll get the Graty absolutely free! Vince Offer, America’s most trusted name trust in fine as-seen-on-TV merchandise, is back with an inspirational message of hope. After wasting $20/month on paper towels, and absorbing twenty times his weight in cola, Vince and his array of German towels have taken to the airwaves and intertubes with a stunning new value proposition: The Slap Chop, and its trusty sidekick, Graty ™. These magnificent devices promise to make our troubles go away, make tuna (and life itself) exciting, and Make America Skinny again. And just in time. Both appear to be decendants of the No Whammy plunger from a 1980’s game show, and it seems they can be yours for the unbelievable low price of $19.95 + $7.95 shipping and handling + $5.00 processing fee for Graty (that white and yellow cheese isn’t free, you know). Don’t forget to ask about the Foldable Cutting Board, and remember, there’s a limit of five per household. All I can say is “Sham WOW”! Relaxation can be dangerous. I avoided it completely from September 2007 through the end of 2008. In those fifteen months, my wife and I both left years of corporate servitude behind, started consulting and freelance businesses, and I joined with some former colleagues to re-startup a divested division of my former company. Our toddler son had the only stable gig in our family, working the nine-to-five daycare shift. I’m glad to say that my time was his on weekday evenings before bedtime, and all weekend between naps (his and/or mine), and for this I have no regrets. He’s way cool. But the balance of all other waking hours melted into work. Usually this was the fun and engaging type of work, but it wouldn’t ever be confused with relaxation. When I got away from it for a few days here and there, it would stay on my mind; the gears were always turning; the laptop, iPhone, or VPN never far from reach. Until this week. We packed up our operation and headed for Florida to hang out with my parents for the week between Christmas and the New Year. Great weather, beach, pool, grandma and grandpa, and all that good stuff. Everything was rosy. Then I got an idea: let’s cash in a babysitting coupon, so my wife and I could escape for a micro-vacation — like grown-ups! I booked the Ritz up the road in Sarasota, dinner at a great restaurant in town, spa and massages, the works. It was so very excellent. By the time our 24 hour escape had concluded, I felt something I don’t recall experiencing for years: complete and total relaxation. The sound of gears not turning. Mental energy dissipated. Worries forgotten. Brain idle. Then, in an instant, this state of placid harmony was shattered. And I blame the blogosphere. Because it was about at that moment that I came across a BoingBoing post about some 250 earthquakes at Yellowstone in the last few days. Not long thereafter, a similar post appeared on Slashdot. Thus both of my trustworthy sources for important information about the world had independently confirmed that a super-volcanic apocalypse was imminent. It should be noted that I didn’t actually read either of the posts or any of the details; just the headlines. And I vaguely recall having seen a Discovery Channel special about the Yellowstone caldera blowing out half of North America, plunging the Earth into a volcanic winter, and exterminating mankind (or something like that). But I became increasingly paralyzed with anxiety about the untimely arrival of the end of days. Suddenly, fundamentalist terrorism, the threat of nuclear conflict on the Asian subcontinent, and various client deadlines seemed like rather trivial matters. I had to explain my anxiety to my wife, who promised to stock up on canned goods and large bags of rice, just in case. And after pondering my suddenly emergent state of mental instability, the root cause hit me like a chunk of boiling magma: I was relaxed. Nature is completely intolerant of a vacuum, so the Volcanic Apocalypse rushed in to fill the void. I’ve been working on purging this virus, with the help of some Wii Bowling, reading, and music. The gears are going to have to start turning again by Monday, so I think I should be safe for a while. But I’m hoping the present blog provides another outlet to diversify my mental energy in the months to come. If it gets quiet for too long, I’ve probably either reverted to my old ways, or perhaps we’re all just buried under several feet of ash.